This Valentine’s Day, save your money, spare your waistline and give a truly priceless gift- the gift of love and memories for the entire family. (Note, this works just as well whether you are single and dating or have a huge family). This idea is so simple, that even the artistically challenged like myself can quickly and easily execute it. What it lacks in difficulty it makes up for in its substantial benefits. 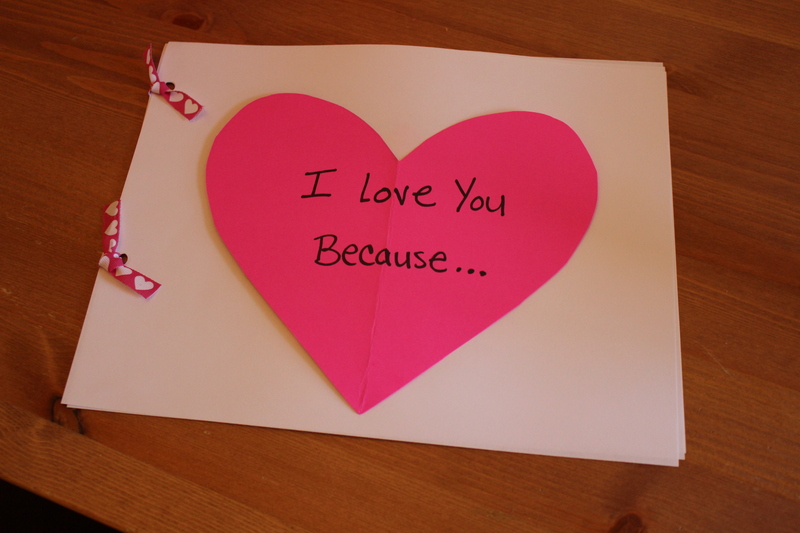 I plan to start this on February 1st, so that everyone will get a warm fuzzy each day leading up to Valentine’s Day. If this seems too daunting, you could always shorten the time frame to one week or even just a few days. 2) Write the person’s name on the bottom corner or back. You can assign a color to each family member or do it at random. I chose to color-code so it will be easier for the kids to hone in on their own hearts on the wall. 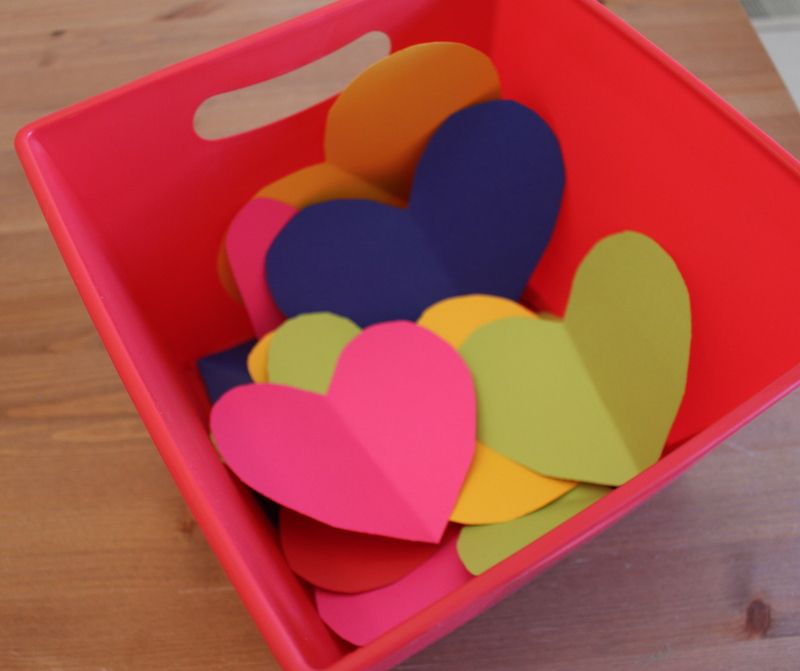 3) Put the hearts into a bin. 4) Display it. I plan to post them after the kids go to sleep so they can wake up to see their new heart each morning. I chose to display it on a wall by the kitchen table where everyone is sure to see it at least three times per day. It doubles as an adorable seasonal decoration! Children thrive on positive reinforcement. They beam with pride upon receiving a compliment and it motivates them to keep doing those great things. Each day they will wake up in eager anticipation to see what compliment their new heart holds. Making the hearts for family members teaches them selflessness and thoughtfulness while further developing their writing, drawing, literacy, creativity, language development, and fine motor skills. The notes from siblings will validate them as big(little) brother(sister). Okay, I’m a realist, they will have no clue what is going on and will most likely try to eat it. But I promise, this WILL benefit them too. It will serve as a great memory source providing a glimpse back to what they were like at this moment in time. This is a great way to record the minutiae that may not get recorded in a journal or baby book. Instead of writing “you are sweet” to my baby girl, I am going to write “I love that you say ‘tank oooo’ when you hand us something”. When I look back years later, I will vividly remember her waddling up to us with a toy, handing it to us and saying “thank you”. It is also an opportunity for their older siblings to really look at them as people on the inside rather than just playmates. If they are able, let them hold a crayon and scribble on their heart to work on their grip, fine motor skills, focus, hand-eye coordination, and self-expression. Remember, they are little sponges at this age. They are just taking it all in, so continue to set good examples! Let’s face it, being parents is a pretty thankless job sometimes. And when you are caught up in the daily insanity of raising young children, the compliments don’t always roll off the tongue. (Can I get a ‘holla’ from anyone who has ever said “mmm, this dinner is good, isn’t it?” or “Did you see that I cleaned the house today?”) The sad truth for adults is that if you don’t ask for it, you don’t always get it. But a compliment is a compliment, so fish away! This will be a great way to show each other that we DO notice the little things and that we appreciate those just as much as the big ones. It will be insightful to hear how the kids see us and a great opportunity to share the unseen with one another (like how happy C looks when he is atop Daddy’s shoulders.) Perhaps this little project will rekindle something between us, as compliments and acknowledgements are something we desperately need to work on. Just the other day we were discussing how authentic our four-year-old’s compliments are (“Wow, you look AMAZING”) and how forced ours often seem. It will make us slow down and reflect on all of our blessings. It will warm our hearts to see the appreciation on our children’s faces. It will provide a creative outlet. If done well, this project will capture a moment in time. It will provide memories that can’t be seen in a picture. I never want to forget that Tink makes a purring gurgling noise when we rock in the glider, that Cubbie stops whatever he is doing to run up to us with a huge hug and smile when we enter the room, or that Jake’s quick-witted comments crack us up daily. 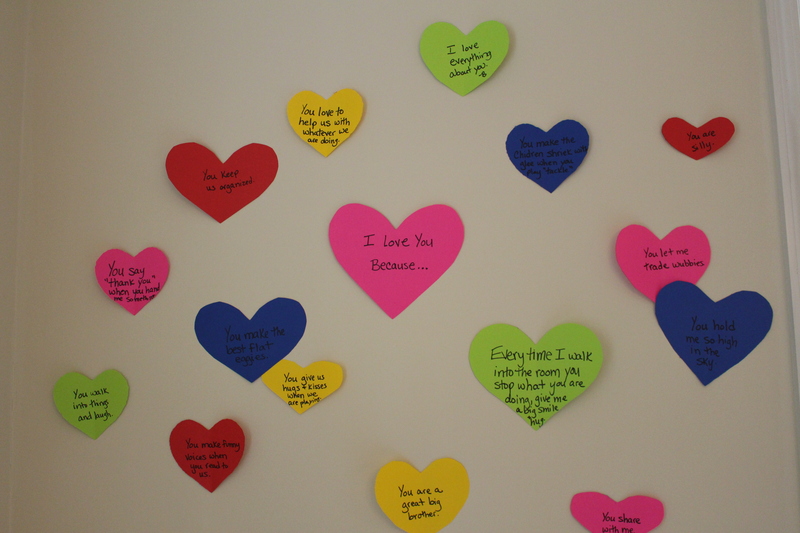 When you finish them, and are ready to take down your Valentine decorations, remove them from the wall, and make them into a keepsake book. I feel like it is Christmas Eve. I am so excited to hear what they say about each other. I can hardly wait to get started on this tomorrow morning! Seems much better than over-priced roses and chocolates, doesn’t it?